Mel's long awaited for gospel album has finally arrived. His unique style incorporates Southern Rock Gospel Blues with Country and a touch of Soul. Don't pass this one up! 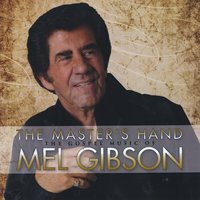 MEL'S JUST RELEASED GOSPEL ALBUM: "THE MASTER'S HAND...Mel is extremely excited for people to hear his new CD on which he has worked so hard and has put so much time and effort into. Every aspect of this carefully chosen and crafted collection of inspirational songs is superb. The music will delight your ears and the words will lift your spirit. In a recent interview with him he stated: "Whenever I hear the phrase "gospel music", I tend to think of the songs I heard in my youth - such great songs as "Amazing Grace", "The Old Rugged Cross", "We Shall Gather At The River", etc. When I started to get serious about my desire to one day do a gospel album, I found myself drawn to songs that give a great spiritual message, but in a slightly different way. Not only can we have upbeat melodies, but also put a lighter spin on the choice of songs. A perfect example of this is on a brand new song, never before recorded, written by Tom Rich titled "I Think about It Anyway" - a great song you'll find alluring and wanting to sing along with. For those who like a more reverent tone, there are such beautiful songs as "One Pair Of Hands", "Someone Above", "In The Garden" and "The Master's Hand". And for those who enjoy my kind of good old "Southern Gospel", there are those songs that will make you want to clap your hands and stomp your feet...such as "So High", my version of "I'm Working On The Building", and more! Mel uses his unique means to drive home the gospel message in each and every one of these songs. So sit back, listen to these wonderful spiritual tunes that will uplift and put a smile on your face! Please also see Mel's website: MelGibsonMusic.com for more information, photos, and also clarification regarding the mistaken identity issues that often arise between the actor and the singer....some of it is suprising.